With volunteer inputs only, it is very difficult for NEMT to keep up with all the proposed developments which could be of concern because of their intrusion into the best hill landscapes. This is also proving a challenge to those NGOs which have paid staff and much greater resources! NEMT is regularly faced with decisions as to which proposals to take a stand on, given that our concerns are focussed solely on the principle of preventing the industrialisation of our finest upland areas. Macritch Hill (below) gives an example. 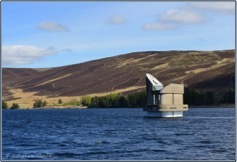 This proposed wind farm is at Backwater Reservoir near Glen Isla on land owned by Scottish Water. The area is outside the boundary of the National Park and cannot be construed as wild land but it is an area regularly visited by walkers. The original proposal has been scaled down by the developer with the number of turbines being reduced and their siting being changed. It will, if it goes ahead, be visible from the Driesh-Mayar plateau but the hand of man is already visible in a number of ways when looking south from there. NEMT decided not to object but did write to the Scottish Government Consents Unit expressing concern about the 'game' that developers are increasingly playing. Proposals are put forward which companies know will lead to objections and which they also know are unlikely to receive consent. They then scale back the number of turbines which appears to suggest that they are listening to concerns. The proposal then receives approval and, surprise, surprise, a few years after the farm becomes operational, the developer returns with a proposal for an increase in the number of turbines arguing that visual intrusion already exists. This then receives consent. Did NEMT make the right decision in not objecting to this one? had environmental information which was not available to the public. did not give proper consideration to the draft Core Wild Land map and that their approval of the project led to that area in the map being removed from its wild land status. did not give adequate reasons for departing from Scottish Natural Heritage's advice. The hearing has taken place but a judgement is not expected until the summer. put the line from the wind farm to the substation underground. build the smaller option of the two types of substation which could be constructed. screen part of the structure with mixed tree planting. NEMT remains opposed to Stronelairig as we do not think that the north side of the Monadhliath is an appropriate place for a large infrastructure project. NEMT is disappointed that SSE cannot identify an option for the substation away from the Corrieyairack completely. NEMT supports the proposal to put the cabling undergrounding and build the smaller of the two possible types of substation. NEMT suggests that SSE creates a much larger area of mixed woodland than appears to be being proposed. This would further screen the development, create a haven for wild life, contribute to carbon sequestration and be enjoyed by walkers travelling through. Taken along with what is going on at the southern end of the pass, this proposed development on the western slopes of the north end of the Corrieyairack would effectively industrialise the whole route. It would be highly visible from the hills at the north of Glen Roy and from Corrieyairack Hill. NEMT has lodged an objection. In the last issue of Mountain Views, we reported that Highland Council rejected the application to create a wind farm on the slopes of Little Wyvis. NEMT had objected to this proposal. The developer has appealed and the Scottish Government has established a public enquiry. The developer has withdrawn the proposal for this project south east of Glen Clova. Whether a further application will be forthcoming has yet to be seen. A decision by the Scottish Government is still awaited. This major, and very controversial proposal, is on the southern slopes of the Monadhliath on the very boundary of the National Park. As reported in the last issue of Mountain Views, this proposal for a major development at the south east corner of Loch Ericht will be a key test of how seriously local and central government take the spirit of the wild land map. The developer has asked for more time to present its case and the application will be presented to Perth and Kinross Council in May. NEMT, and numerous other bodies, have objected. In itself, this is not a major development. NEMT objected because it is at the gateway to Glen Affric and so raises concerns regarding how far industrialisation will be allowed to creep towards this remote area. Because of delays by Highland Council, the developer has appealed to the Scottish Government. Although part of Scotland's recent updated planning guidance, the wild land map carries no additional statutory protection for land. Time will tell what status planning authorities and central government confer on it. Worryingly, at the Stronelairig judicial review (see above) Counsel for Scottish Ministers argued that 'safeguarding' wild land means taking steps to mitigate the effects of developments, such as reducing the numbers of turbines, rather than protecting such areas from developments. There is a considerable amount of smaller scale hydro development going on throughout the highlands. It is perhaps worth making the point that NEMT has not, to date, lodged an objection to any hydro proposals.